Floral colours change almost like colour-changing handkerchiefs in a magic show! However, unlike that magic trick, the stunningly large flowers do it very gracefully over a period of a day. They open the purest of white in the morning, then very gradually change to light pink in the afternoon and darken to rose-pink towards end of the day. One-day bloomers that flop and drop dead the next day. This changeable beauty is a large perennial flowering shrub or small multi-stemmed tree that grows vigorously and blooms abundantly. Truly a remarkable plant that usually present as many as three different floral colors simultaneously as the delicate flowers create their magic show with their ever changing hues. John and I have got to admire them at Siloam House in Karak, Pahang, a family home for intellectually-challenged children, during our very recent visit there with our BEC friends as part of our Lenten Season project. We were enraptured by the gorgeously large snow-white flowers that adorned 3 large bushes whose identity we didn’t know then. Pity though that I didn’t photograph their remarkable white beauty that morning because by the time we were briefed by Ms. Lim Saw Gaik, the Home’s director and toured its extensive farm, the stunning flowers were already clothed in fabulous pink hues a couple of hours later. Frankly, John and I had totally forgotten about their changeable characteristic since we last saw this plant many moons ago when we were youngsters. Otherwise, adding a couple of photos with the spotless white flowers here would have completed the show, huh! Etymology: The species name or epithet, mutabilis, meaning ‘variable or changeable’, aptly describes the flowers notable characteristic of changing colours with age. The common name, Confederate, came about because at one time it was very common in the area of the Confederate States of America. 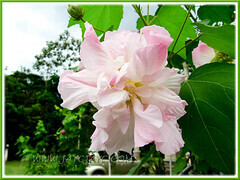 Features: Hibiscus mutabilis is one of the notable species of the rather large genus, Hibiscus, that consists of several hundred species. An old-fashioned perennial shrub or small multi-stemmed tree with lax branches that grows vigorously to 15 ft (4.6 m) tall and spreads to 10 ft (3 m) wide. 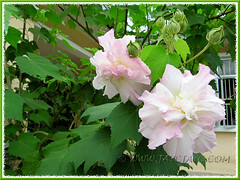 Truly a large flowering shrub that needs a large space in the garden to showcase its spectacular beauty. It is evergreen in the warm tropical and subtropical regions, and produces buds and flowers abundantly throughout the year. An enthusiastic and prolific bloomer that produces showy flowers that are large, 3-5 inches (8-13 cm) in diameter, mostly double with rose-like blooms though some are single, and having changeable colours or otherwise. Typically, the flowers will open snow-white in the morning, and change gradually to pink in the afternoon and deepen to rose-pink by evening, withering and dropping off the next day. Hence, not at all surprising to see the various hues on the shrub at any one time. Some specimens have flowers that start off pink instead and then turn to white or darker pink as it ages. 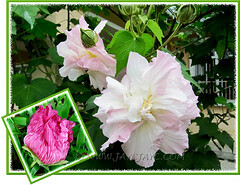 However, there are some varieties with other variable forms, such as H. mutabils ‘Rubrum’ (Red Confederate Rose), a single with deep-pink or raspberry-pink flowers that does not change colour at all and other varieties with entirely white, pink or red flowers that remain unchanged too. As attractive too is the plant’s foliage. 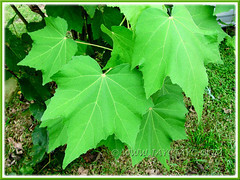 The bright green leaves are large, measuring 5-7 in (13-18 cm), deeply lobed and distinctly veined like the maple leaves, and have hairy undersides. They’re held on long petioles arranged alternately along the slender stems. 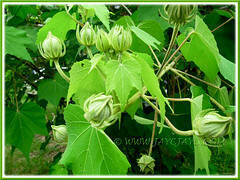 Flowers will eventually set fruits which are round and hairy capsules containing fuzzy seeds. 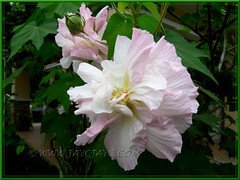 Culture (Care): Hibiscus mutabilis is an easy to grow flowering shrub that requires very little care. Light: Grow best in full sun or light shade. Moisture: Average water needs. It is drought tolerant in good soil. 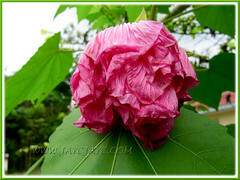 Leaves wilting or drooping indicates insufficient water. Soil: Prefers rich, well-drained soil, though not particular as the plant is tolerant to most soil types as long as well-drained. Others: Prune when necessary. It can take to hard pruning. Susceptible to white flies, aphids, weevils and caterpillars, so be on the alert to nip problems in the bud. Propagation: By cuttings that root easily in water or soil. Can be propagated by seeds too though cuttings is a lot faster than seeds that take longer time to mature and bloom. Usage: Confederate Rose, with its huge bushy form and adorned with an abundance of big leaves and attractively multi-coloured flowers, will definitely make excellent specimen or landscape plant in the garden. Showy and impressive, it’ll be ideal in a border, giving shade to ground-covers planted below, or in a mixed shrub border or grown en masse as informal hedge or screen. 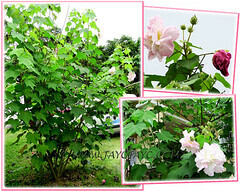 H. mutabilis is known to be widely used in China as a traditional medicine – flowers and leaves are used as expectorant, analgesic and antidote to poison, or applied to swellings and skin infections. 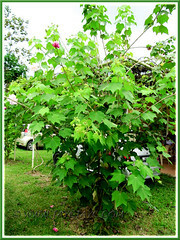 Read more of its traditional uses at StuartXchange – Philippine Medicinal Herbs. This is the hibiscus I’ve been longing to see for a long long time but still haven’t seen the real one yet. It is really beautiful. Autumn Belle: Thank you. For us this beauty was last seen more than half a century ago and definitely brought back some sweet memories. John said that he remembered the shrub being known as ‘Jealousy flower’ when he was young, with a sad story attached ….a man gave his girlfriend a white flower before going off to work but saw her having a dark-coloured flower on his return in the evening. He apparently killed the girl out of jealousy with the assumption that she was unfaithful. is this toxic to dogs?